The doctor told Joe that he was dying. He was a grizzled entrepreneur. His bones felt tired, but his pants rustled listlessly against the smooth leather of his friend’s couch. “Look, Joe, you’re a smart guy. In fact, you kind of inspired me to build my empire, but I don’t know what to tell you.” Sam said apologetically. Joe didn’t reply right away. ‘How did I get here,’ he thought. He’d expected so much more from his life. He’d never expected to be sitting nervous in his friend’s mansion, while his own sticker-selling company lurched along like a zombie. It was dying too, along with Joe. ‘Nobody will miss it, unless I can somehow make something of it before it’s too late.’ Joe grimaced as the reality hit him. And like, it’s not as if he didn’t try. He read self-help books. He studied business. He made good money for a while. Got married. He took all the actions you’re supposed to take. So why was he so plateau’d? His passion for business gone. Failed to write his memoirs. His body frail, looking decades older than his age. Joe knew Sam cared about him, but it was clear he wouldn’t take StickerCo. off his hands. Why would he? “Man, I dunno Joe. Let me make us some more coffee and I’ll think about it.” Sam picked up the cups and left the room. Joe’s heart sunk, and his head drooped, and his gaze came to rest on one of Sam’s coffee-table books. The title read ‘Soaring Beliefs’ by ‘J-Ryze.’ It seemed to vibrate, as if calling to him. Joe reached underneath the table’s glass pane and picked it up. It felt good in his hand as he opened the first glossy black page. Weird, it seemed to be a self-help book? He’d barely read the foreword, when Sam returned with coffee. The next day Joe had devoured the entire book. It was a short read, lots of gorgeous pictures, and every word was made to count. Regardless, he knew he’d be reading it again and again. Each page was like eating a full, satisfying meal… but for his mind. Each page opened his eyes in major ways to things he’d taken for granted. Joe had had hundreds of conversations about money, fame, death, hustle, etc. And those conversations never really got to the truth of things. They were just people echoing society’s group-think. J-Ryze tackled each subject with clarity, integrity, and precision. He revealed the truth. Joe realized this is what he’d needed his whole life. Because once he understood a topic, all his actions changed around it. 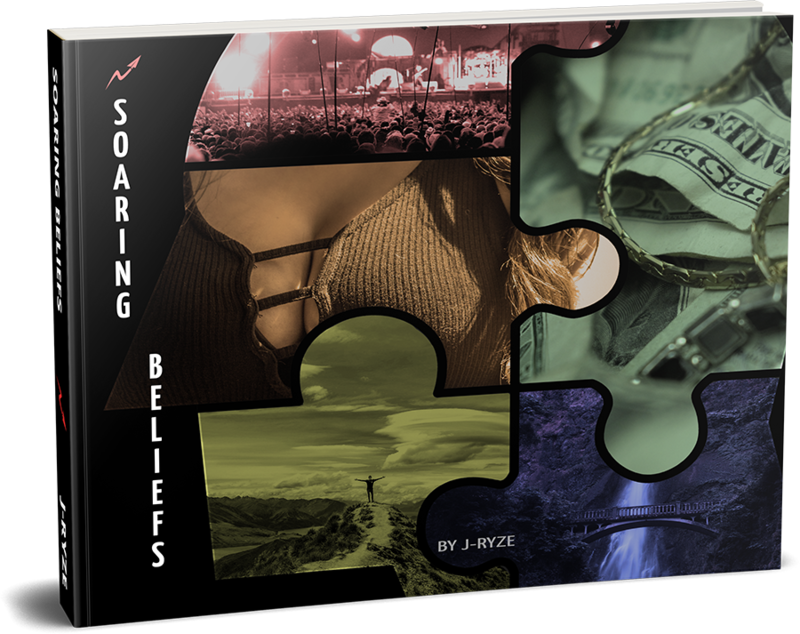 He read the page about beliefs, and now understood that better beliefs change entire lives. He stopped trying to sell StickerCo. He read the page about Sasha Grey, and now understood how to tackle new industries. He began to write his memoirs. He read the page about biokinesis, and now understood that his health was under his own control. He began looking for better doctors. It was amazing that a handful of pages could elevate his beliefs that powerfully. The book was a game-changer. Joe breathed deep and clear. He was eager for whatever came next. Want to learn more about The World's First Personal-Development Coffee-Table Book?